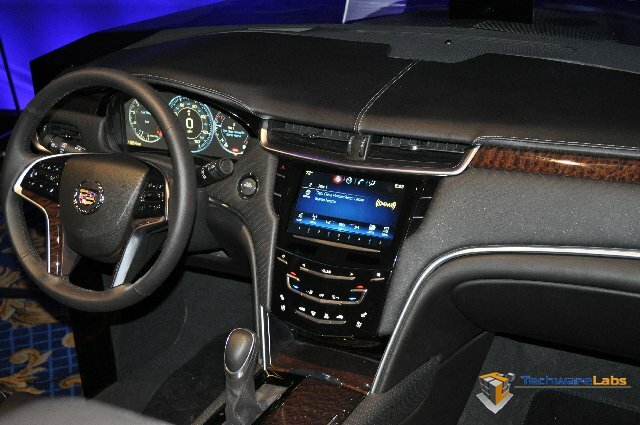 Cadillac held a press conference at CES 2012 to promote their CUE (Cadillac User Experience) system which will come in the 2013 Cadillac XTS and ATS luxury sedans and the SRX luxury crossover. Some of the features are covered in the short video below. This integrated feature rich system is quite a step forward from the simple in-dash systems. The CUE system not only makes modifications to the display between the driver and passenger, it also updates the driver dashboard to keep the drivers attention look forward and on the road. The demo that was shown at the press conference for to sit in and give us a hands-on experience of what it is like to sit behind the wheel and operate the CUE system spoke volumes to us since we have all played with sounds systems before but it all changes once you install the system into the dash of the car and then discover you can’t access or view the screen b/c your automobile wasn’t designed for a flip up display. We the easy to use and navigate CUE system is also customizable with the ability to update the drivers display and theme out your dash and center display. 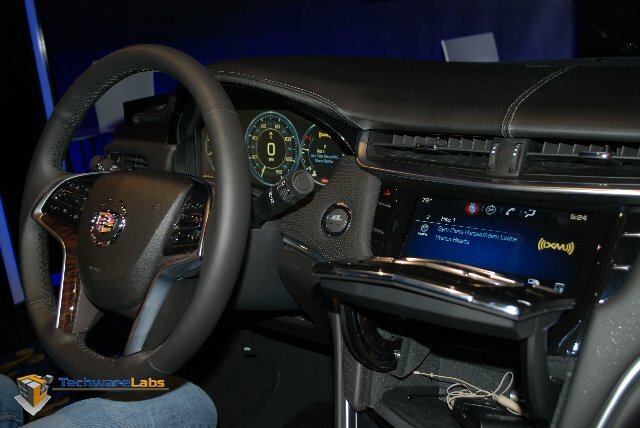 Showing the drivers display and the steering wheel with the many buttons. Shown here is the display of the CUE system flipped up to provide the storage and I/O area with a USB port and iPhone cables. 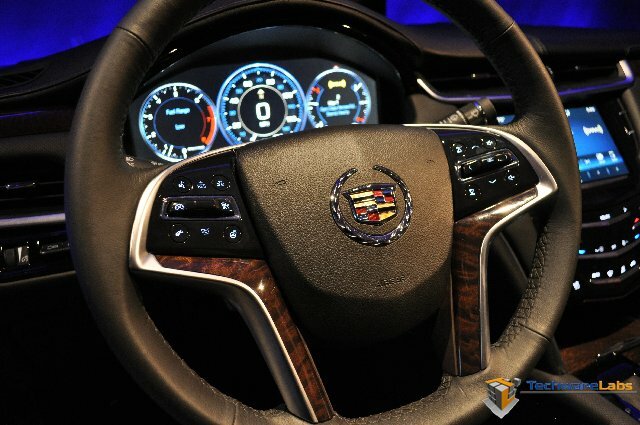 The steering wheel looks a lot busier than the standard steering wheel we are use to, but with the CUE system it isn’t about static buttons the steering wheel, it is about a touch screen that can be updated year after year which will keep you two or three year old car updated with the latest features that may not exist at the time the car was originally manufactured, but can be simply updated by a software upgrade at a local dealership or maybe even on the fly via an APP update we all with smart phones have grown to know.